There's no longer any need to ask your neighbor to water your plants while you're away. Craftzine's houseplant wicking system offers a very simple solution: Cut some cotton strips. Soak one end in a bowl of water. Bury the other end in the soil of each plant, which in turn keeps the roots moist without drowning them. 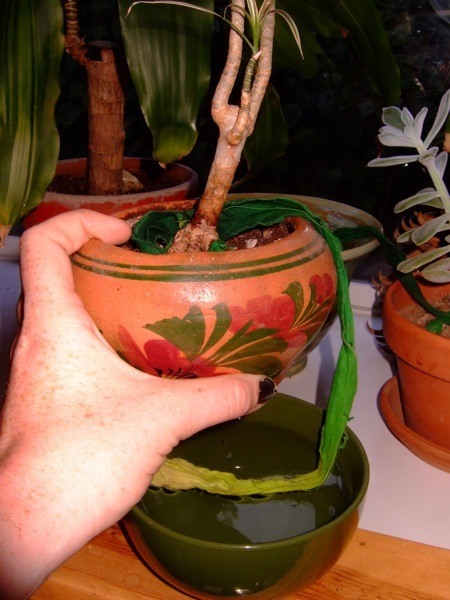 Read now: Create a Simple Houseplant Wicking System. Just wanted to say this works great on grandma too. Just replace water with vodka and you're all set to go.